Yesterday (9/17/2014) our local paper ran an op-ed article by Ashley Spillane, “prez” of an organization called Rock the Vote. http://www.rockthevote.com/about-us/. The piece was a regurgitation of her standard rant against voter ID laws that gets published in local papers all across our fair land. My reply to the article was published in today’s edition of our paper, with a glaring omission. They elected to not include the last pair of sentences. 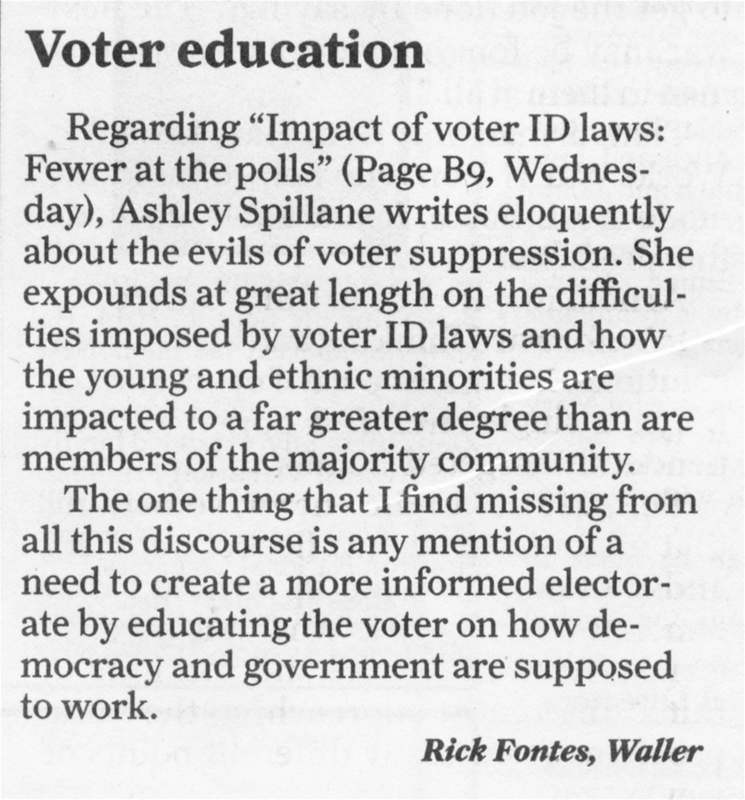 I will reproduce them below my letter to the editor, shown as printed. Since the editorial slant of our local paper leans heavily toward one party, I can only surmise that they identified any effort to dumb down the electorate with their side of the aisle. In my opinion, the low information voter is a major problem. I do not espouse any sort of suppression of voters and I do believe that education is the answer. I feel that civics should be a required subject, taught with age appropriate materials, in each grade level elementary through high school. No, we don’t need to bring back literacy tests, just present the facts about how government is supposed to work and let developing minds come to their own conclusions. Every eligible voter should be encouraged to vote but with suffrage comes the responsibility to be informed. Rock the Vote purports to be a non partisan organization. I have visited their site and I wonder. I invite you to do the same (visit, not wonder). No matter what your political affiliation, please, an informed electorate is the only thing that will save our nation. I have no cause for you to sign onto, no donations requested, just spread the idea that we, as a people, would prefer those pulling the levers in the voting booths to have some clue as to what their vote actually means. The nation you save just might be your own. This entry was posted in Uncategorized and tagged Ashley Spillane, civics, Houston Chronicle, informed electorate, low information voter, Rock The Vote, voter ID laws, voter suppression. Bookmark the permalink. I agree. A voter should not just pick someone willy-nilly without knowing who he or she is voting for. And that is my chief concern. In a democratic system there will always be some who don’t bother to inform themselves before voting. Historically the majority of those people also did not bother to go to the polls and so their ignorance of the candidates and issues was pretty much a non factor. This current trend of recruiting the low information voter and “driving” him and her to the voting booths is having a serious detrimental effect on the process as a whole. We all want universal suffrage but not at the expense of having ill-informed voters pulling the levers. The classic catch 22. Why can’t I wonder too. . .or is that wander. Both can be a bit dangerous at time. HA! Every age has its pundits decrying the younger generation and the harm being done by them to the culture at large. But just suppose that they are all correct, that ancient Greece was the highest possible pinnacle for mankind and everything since has been a toboggan ride down the slippery slope. Within the lifetimes of many still alive and kicking there have been a great many “freedoms” gained. But at what cost to the moral and ethical fiber of our culture? Somewhere between Sharia law and absolute decadence lies the ideal.